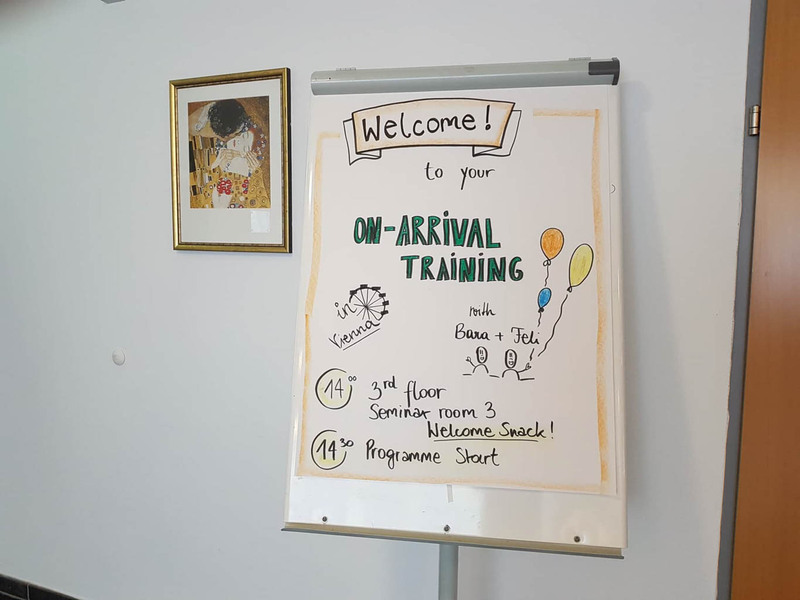 Last week, European Wilderness Society’s wilderness volunteer Rebecca Hollely spent four days in Vienna to take part in the On-Arrival-Training from the European Voluntary Service programme of Erasmus+. At the On-Arrival-Training volunteers from all across Europe (and even beyond) meet to share their first impressions, experiences and ideas. During this training, the volunteers explored aspects of non-formal, lifelong learning and intercultural sensitivity. It was also an opportunity to learn the structure of Erasmus+ and the European Voluntary Service. There were 9 volunteers from 8 different countries, who work in a range of projects across Austria. For example, working in social entrepreneurship competitions, museum events, and radio stations, and of course working with the European Wilderness Society. These reflect also the diversity of programmes available throughout Europe. While normally the volunteers come from European countries, there is always one volunteer per year from outside the EU. This year, the Committee selected a volunteer from Indonesia to volunteer. It is the first time she left her country, to volunteer at her preferred Hosting Organisation within the European Voluntary Service programme. The training focused on how to communicate and work with people from different cultures. The group also visited the National Agency, who co-ordinate the volunteering projects in Austria. There was space for creativity, self-assessment, and planning for the next year. Additionally, there was the opportunity to share thoughts and experiences, which allowed all the volunteers to give and receive feedback, reflection and empowerment. The focus on intercultural sensitivity will be particularly useful for my work with the European Wilderness Society. The training allowed me to consider new communication methods and the many different perspectives of people from different cultures. Our Wilderness team is also very multicultural, so I am sure I can use this experience well. Do you want to be our next volunteer? The European Wilderness Society will soon be accepting applications for the next volunteer, who will start in early 2019. We will start to announce the open invitation for interested volunteers through different platforms, including our own website. If you are interested, please keep an eye on the website, or sign up to our newsletter. Also, make sure you get familiar with the European Voluntary Service and European Solidarity Corps programmes from Erasmus+ to be fully prepared to start your wild adventure!